Born in Nice, France, Chef François Payard proudly continues the Payard legacy, with butter, sugar, cream, and chocolate an integral part of his heritage and cultural DNA as a third generation pastry chef. He learned the art and science of pastry working alongside his grandfather in his fabled shop on the Riviera, Nid des Friandises, and from his parents. From the Riviera he moved to Paris, honed his skills at some of the top restaurants, and moved to New York in 1990 where worked as the Pastry Chef at New York's Daniel, and at Le Bernardin, and earned the acclaimed distinction of "Pastry Chef of The Year" (1995) by the James Beard Foundation. 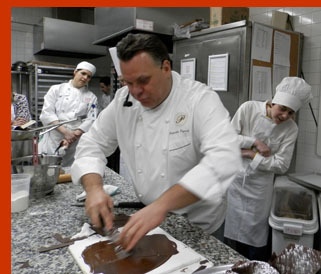 In 1997, he opened his own pastry shop, Payard Pastisserie, in New York. 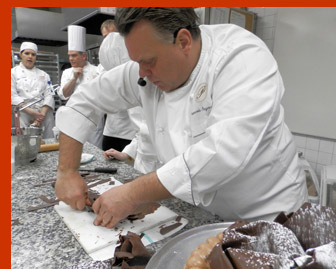 Career distinction continued in 1998, when he was awarded "Pastry Chef of The Year" by Bon Appétit Food & Entertainment Awards and again in 2001 by the International Pastry Competition Committee-Beaver Creek. In July 2004, the French Government honored him with the prestigious "Ordre du Mérite Agricole" (Medal of Honor), in 2005 Wine Spectator presented him with an "Award of Excellence," in 2006 he was selected as a member of Relais Desserts International, a professional association of the "85 Best Pastry Chefs in the World," and in 2010 he received the Dom Pérignon "Award of Excellence" which recognizes outstanding leadership, character, and work ethic in the hospitality industry. Not one to sit back and relax, he is also the author of 4 cookbooks, with cookbook number 5 coming soon, and now has several shops located in New York, as well as in Las Vegas, Japan, and Korea. 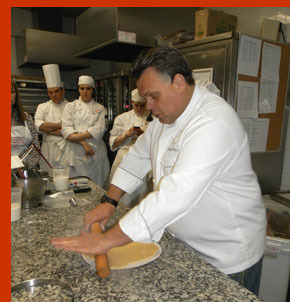 Chef Payard's impressive background is indicative of the high caliber of chefs that participate in the annual New York Culinary Experience held at The International Culinary Center in New York. In 2015, the NYCE celebrated its 7 year, with its 2-day weekend of classes held on Saturday and Sunday, April 11 - 12, 2015, with 30 top toques of the world teaching classes. This was Luxury Experience's 4th year in attendance, and my second class with Chef Payard. 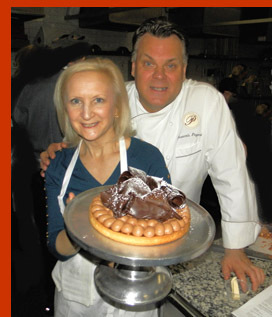 (Read about my previous class with Chef Payard: Chef Francois Payard makes French Pastry at New York Culinary Experience). Expect to be challenged and to be rewarded with learning the art and science of making sensational French pastry when taking a class with this dynamic chef, and when you leave his classroom carrying your day's creation in one of his famous orange Payard pastry box, you can feel proud of what you were able to achieve. 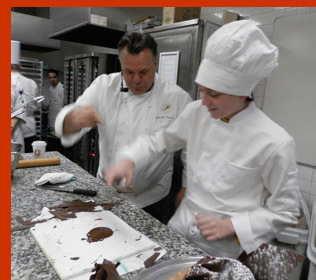 The class consisted of mixed ages with the youngest student, Brandon Zazza, age 12, already passionate about baking and perhaps is one to watch for in the future, so keep posted in Luxury Experience. Dressed in full chef regalia, he was ready and dedicated to achieving his best alongside the renowned Chef Payard. Before the class got into the day's curriculum of making a Caramel Peanut Tart, Chef Payard demonstrated to Brandon and the rest of us how to write with melted chocolate using a pastry bag and the importance of practicing this art as it is what distinguishes an artisan creation. 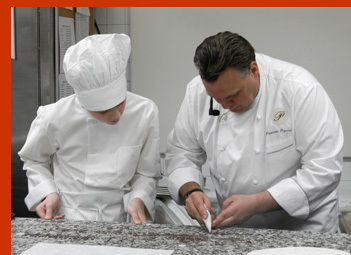 When Chef Payard gave the pastry bag to Brandon, he generously assisted his young student to write and create designs. What a memorable experience especially for one so young, yet determined. What I especially like about taking classes with Chef Payard is his generosity to share, to encourage, and have his students succeed. Chef also demonstrated how to test the temperature of melted chocolate without a thermometer by dabbing a small amount just above your lip, the most sensitive part of your body, as the chocolate should feel warm but not burn you. Next, he showed the class how to shape melted chocolate by smoothing it over a cold piece of marble, then lifting it quickly and shaping it into various forms, which he had several students try their hand at creating unique decorations to embellish cakes and tarts. When taking a class with Chef Payard, there is always what they call in New Orleans, a lagniappe (a little something extra), in this case, more than just what is in the day's curriculum. 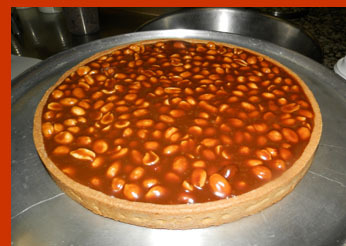 Chef François Payard graciously shares his recipe for Peanut Caramel Tart. Chef Payard writes, "The tart is an interpretation of a hazelnut-caramel tart I used to make when I was the pastry chef at Restaurant Daniel, using America's favorite nut, the peanut. Roasted peanuts combined with caramel to make a gooey, texture-rich filling that peaks through mounds of chocolate whipped cream. I like to think of it as a sophisticated candy bar. Having the cream at room temperature when you pour it into the chocolate limits the temperature contrast between the two, and thus reduces the splatters." Makes enough for two 9-inch tarts. Bake one, freeze the other one for another time. Method for the Dough: Combine the butter and sugar in the bowl of an electric mixer fitted with a paddle attachment. Mix on medium speed until they are fully combined. With the motor running, incorporate the egg yolks and the egg one at a time. Do not add an egg until the previous one is completely incorporated. Add the flour, and mix until everything is incorporated and the dough is smooth. Remove the dough from the bowl, wrap in plastic wrap, and refrigerate until completely chilled, at least 1 or 2 hours, preferably overnight. 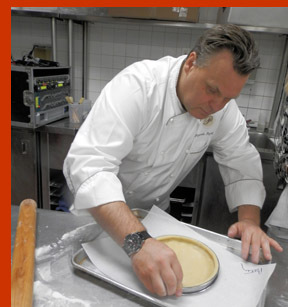 Tips from Chef Payard: "Pastry is a science. You must read the recipe and understand it before you make the recipe. With dough, you want to work it as little as possible. Cream your butter and sugar then add your eggs, then add your flour. Do not add flour first because it will release too much gluten and the dough will be tough. Dough wrapped in plastic wrap will keep for up to 2 months in the freezer." Assembly: Brush the sides and bottom of a ring-mold or a fluted 9-inch pan with removable bottom with butter. On a lightly floured surface, roll out the dough until it forms a circle about one-quarter of an inch thick and 12 inches in diameter. Drape the dough over the rolling pin, and unroll it over the pan. Gently press the dough into the pan, making sure it fits snugly. 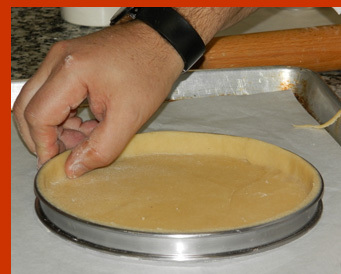 Roll the pin over the top of the tart shell to remove the excess dough. Place the pan in the refrigerator for 30 minutes, to let the dough rest. Baking the Tart Shell: Preheat oven to 375°F (191° C). Place the tart shell on the center rack in the oven and bake for 20 - 25 minutes or until golden brown. Let it cool in the pan on a wire cooling rack. Tip from Chef Payard: Use ring molds without bottoms which ensure even baking and provides you with the opportunity to lift the tart during the baking process and check the color of the bottom of the tart. Method for the Filling: Place the chocolate, peanuts, and honey in a medium bowl and stir to combine. Set aside. Place the sugar, corn syrup, and salt in a medium saucepan over medium-high heat. Cook until the mixture turns a dark brown caramel. Tip: Test the color of the caramel on a piece of parchment. If sugar sticks to the sides of the saucepan, dip a pastry brush in water and brush the sides. Remove the saucepan from the heat. 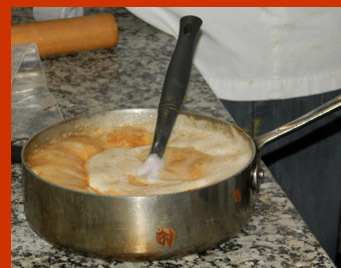 Tip from Chef Payard: Whisk the cream instead of heating it, and then add it to the caramel so it will not splatter. 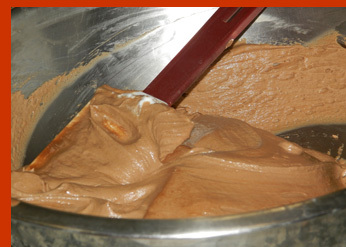 Pour the caramel mixture over the chocolate mixture, and whisk until everything is combined. Pour the warm filling in the baked tart shell and let cool. Other Nut Options: Chef Payard notes that you can also use almonds, hazelnuts or other nuts as a substitute for the peanuts in this recipe. Method for the Chocolate Whipped Cream: Assemble a double boiler by filling a medium pot one-third full with water and bring it to a gentle simmer over medium heat. Place the chocolate in a bowl that will fit snugly on top of the top but will not touch the water. Reduce the heat to low and place the bowl over the pot. Stir occasionally until the chocolate melts and the mixture is smooth. Remove from heat and set aside. With a spatula, fold half of the whipped cream into the chocolate to cool it down. Fold in the remaining cream, and refrigerate until firm about 20 minutes. Assembly: Fill a pastry bag or a resealable plastic bag with the chocolate whipped cream, and cut a half-inch opening n the tip or corner of the bag. 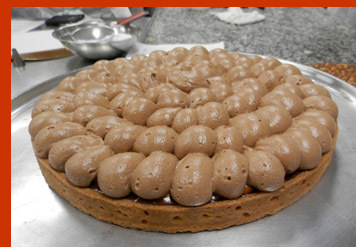 Pipe little mounds of the chocolate whipped cream around the edge of the tart without leaving gaps between them. Pipe a single mound at the center of the tart. Garnish: Chocolate Shards, or if more daring, mold melted chocolate into a decorative shape and place it on top of the tart. Arrange the chocolate shards over the top of the tart. Serve at room temperature. 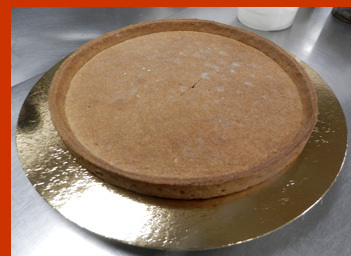 The tart can be assembled up to 1 day ahead and kept refrigerated. Bon Appétit! Read about other classes from the NYCE 2015 in the Gastronomy section and interviews and recipes from the chefs in the Chefs' Recipes section. Follow Luxury Experience on Facebook to listen to interviews with the chefs and see more photos from the event www.Facebook.com/LuxuryExperience along with chef videos. 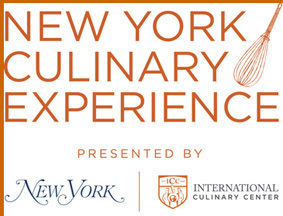 For information on attending The New York Culinary Experience 2016, please visit the New York magazine website: www.NYmag.com. © May 2015. Luxury Experience. www.LuxuryExperience.com. All rights reserved.